Is The Kroger Co. (NYSE:KR) an excellent investment right now? The smart money is turning bullish. The number of bullish hedge fund bets went up by 3 recently. 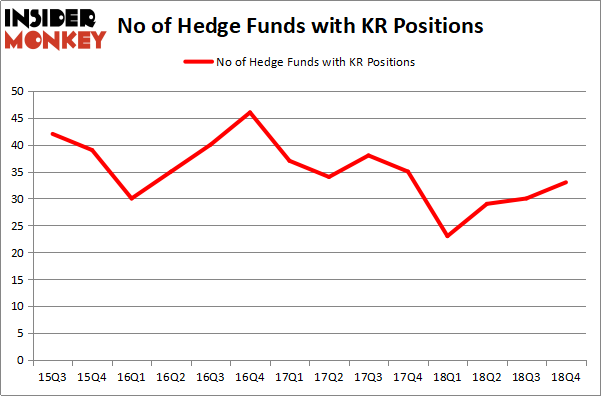 Our calculations also showed that KR isn’t among the 30 most popular stocks among hedge funds. The Kroger Co. (NYSE:KR) was in 33 hedge funds’ portfolios at the end of the fourth quarter of 2018. There were 30 hedge funds in our database with KR positions at the end of the previous quarter. We’re going to take a glance at the fresh hedge fund action surrounding The Kroger Co. (NYSE:KR). How have hedgies been trading The Kroger Co. (NYSE:KR)? At the end of the fourth quarter, a total of 33 of the hedge funds tracked by Insider Monkey held long positions in this stock, a change of 10% from the second quarter of 2018. The graph below displays the number of hedge funds with bullish position in KR over the last 14 quarters. So, let’s check out which hedge funds were among the top holders of the stock and which hedge funds were making big moves. Among these funds, AQR Capital Management held the most valuable stake in The Kroger Co. (NYSE:KR), which was worth $429.5 million at the end of the third quarter. On the second spot was Citadel Investment Group which amassed $37.6 million worth of shares. Moreover, Adage Capital Management, Element Capital Management, and Arrowstreet Capital were also bullish on The Kroger Co. (NYSE:KR), allocating a large percentage of their portfolios to this stock. As industrywide interest jumped, specific money managers were leading the bulls’ herd. Element Capital Management, managed by Jeffrey Talpins, established the most outsized position in The Kroger Co. (NYSE:KR). Element Capital Management had $17.1 million invested in the company at the end of the quarter. Peter Rathjens, Bruce Clarke and John Campbell’s Arrowstreet Capital also made a $15.9 million investment in the stock during the quarter. 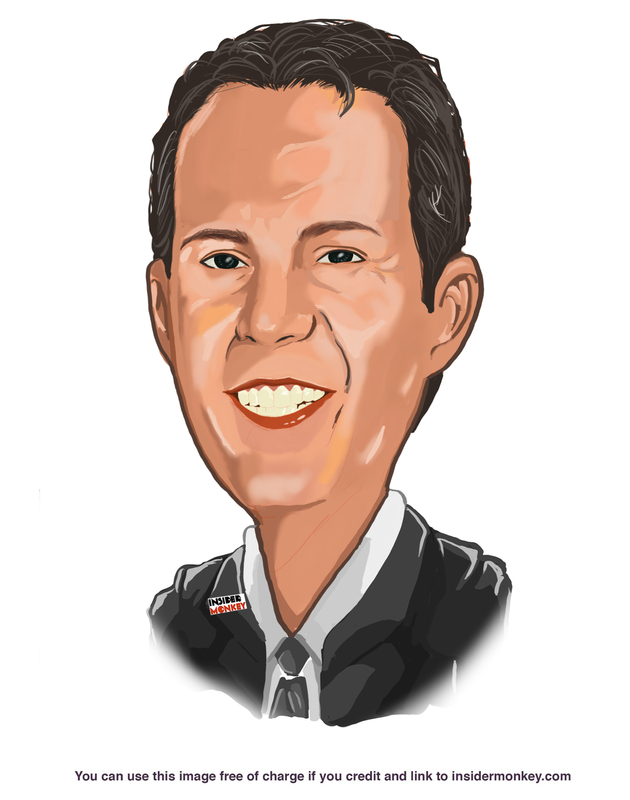 The other funds with new positions in the stock are Jim Simons’s Renaissance Technologies, Ben Levine, Andrew Manuel and Stefan Renold’s LMR Partners, and Mike Vranos’s Ellington. Let’s check out hedge fund activity in other stocks similar to The Kroger Co. (NYSE:KR). We will take a look at Twitter Inc (NYSE:TWTR), WEC Energy Group, Inc. (NYSE:WEC), Coca-Cola European Partners plc (NYSE:CCEP), and Alexion Pharmaceuticals, Inc. (NASDAQ:ALXN). This group of stocks’ market caps are closest to KR’s market cap. As you can see these stocks had an average of 30 hedge funds with bullish positions and the average amount invested in these stocks was $1073 million. That figure was $574 million in KR’s case. Twitter Inc (NYSE:TWTR) is the most popular stock in this table. On the other hand WEC Energy Group, Inc. (NYSE:WEC) is the least popular one with only 13 bullish hedge fund positions. The Kroger Co. (NYSE:KR) is not the most popular stock in this group but hedge fund interest is still above average. This is a slightly positive signal but we’d rather spend our time researching stocks that hedge funds are piling on. Our calculations showed that top 15 most popular stocks among hedge funds returned 19.7% through March 15th and outperformed the S&P 500 ETF (SPY) by 6.6 percentage points. Unfortunately KR wasn’t in this group. Hedge funds that bet on KR were disappointed as the stock lost 11% and underperformed the market. If you are interested in investing in large cap stocks, you should check out the top 15 hedge fund stocks as 13 of these outperformed the market.